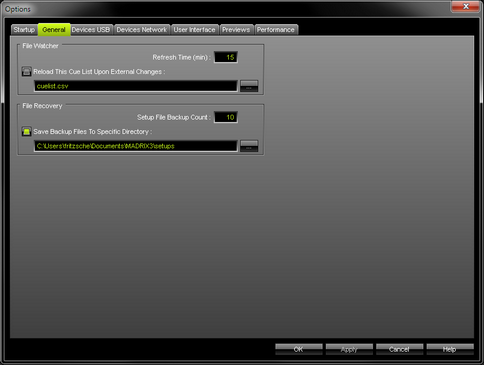 MADRIX can automatically and regularly reload a Cue List within a pre-defined refresh time. ▪ Enter the Refresh Time (min) in minutes. The File Watcher with its Automatic Cue List Reloading feature is very useful if you are using an external program that creates a Cue List in the *.csv file format. ▪ If this Cue List is changed, you are easily able to access the new Cue List without modifying settings within MADRIX. ▪ In order to work with this feature, simply create a new Cue List, save it using the *.csv file format and open the file with a text editor or other appropriate software. ▪ MADRIX can save its Cue List also in *.csv file format. ▪ Save Backup Files To Specific Directory - Enable this option if you want to set up a specific directory where the backup files should be stored. This can be external drives. If this option is disabled, MADRIX will save the backups in the same directory as the Setup files. - By default, MADRIX automatically chooses a user directory for Setup files. ▪ All General options will be saved locally on your computer. The settings described in this topic will not be saved in your MADRIX Setup file.